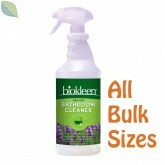 Earth Friendly Products Floor Cleaner Concentrate in Lemon Sage scent is the highly concentrated Neutral Floor Cleaner. Natural, safe & effective, this pH balanced, Concentrated Floor Cleaner, is made from sustainable, plant-based ingredients. Like the regular, Ready to Use (RTU) version, this concentrated floor cleaner cleans wooden floors, laminates, ceramic tile, vinyl floors, natural linoleum, marble and more while leaving behind a fresh, but mild Lemon & Sage scent without leaving behind chemical residues. Howeve this Concentrated version dilutes at 1:128 for general floor cleaning and 1:64 for heavily soiled floors. Earth Friendly Products Floor Cleaner Concentrate has been naturally formulated to clean and protect floors and floor sealants in both residential and commercial flooring establishments. The neutral formula will NOT strip floor wax or sealant when used as directed, so it's great for daily cleaning of general soils from foot traffic and is also great for removing tough spots, spills & stains including scuff marks. 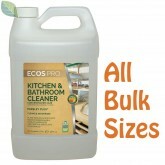 Earth Friendly Products Concentrated Floor Cleaner is derived from Non-Toxic, Biodegradable ingredients. It's free of synthetic perfumes and dyes, is grey-water and septic safe and is recognized by the EPA's DfE and USDA's Bio-preferred Program. Water 7732-18-5; Caprylyl/Myristyl Glucoside (plant-based surfactant) 110615-47-9; Sodium Coco-Sulfate (coconut-based surfactant) 68955-19-1; Sodium Citrate (plant-based water softener) 68-04-2; Alcohol Denat. (corn-derived solvent) 64-17-5; Sodium Carbonate (mineral-based water-softener) 497-19-8; Natural Fragrance (Mixture); Phenoxyethanol (Preservative) 122-99-6; Methylisothiazolinone (preservative) 2682-20-4.